For ither uises, see Warrington (disambiguation). Warrington is a toun in the north wast o Ingland, historically pairt o Lancashire but, syne 1974, athin the ceremonial coonty o Cheshire. 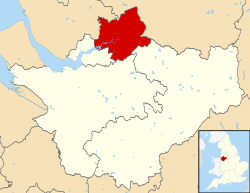 It stand on the banks o the River Mersey, 18.5 miles (29.8 km) east o Liverpool, an 16 miles (26 km) wast o Manchester. The population in 2011 wis 202,228; its population haes mair than doubled syne its designation as a New Toun in 1968. The population o the 'built up aurie' o the toun stand at 165,456, rankin 46t oot o aw urban auries in the UK. ↑ "2011 Census: Key statistics for local authorities in England and Wales". Office for National Statistics. Retrieved 2 December 2015. Wikimedia Commons haes media relatit tae Warrington.